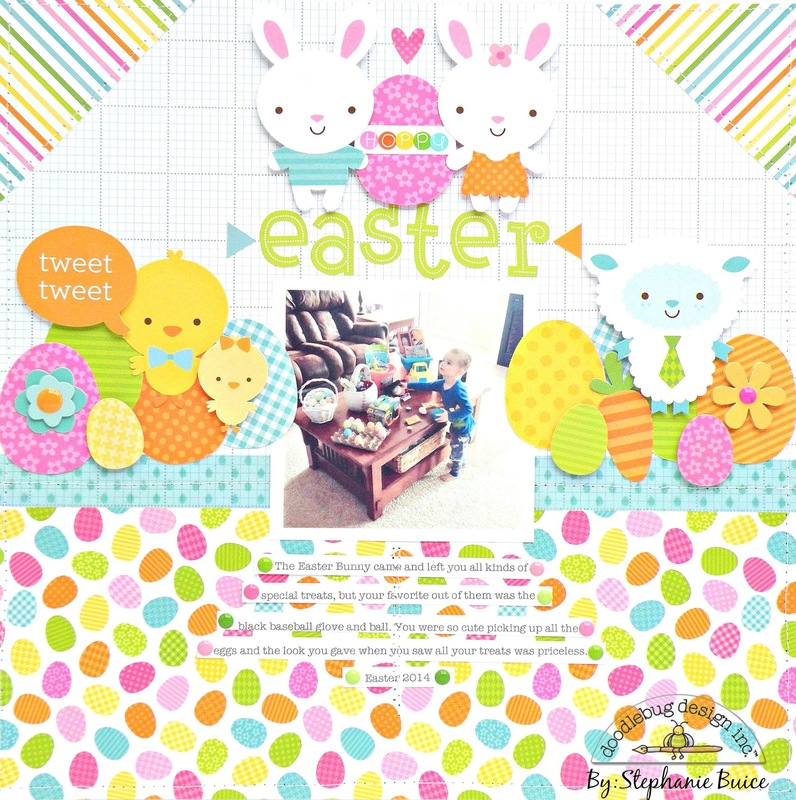 Hi Everyone, Stephanie here today with my Parade Easter layout. When I opened up this collection my favorite thing right off the bat were the Bunny & Friends Reversible Easter Die Cuts. All the little characters were so cute I knew I wanted them on my layout. I decided to use a piece Kraft in Color collection paper as my base to because I felt like my white cardstock was too plain. The grid on the paper made it really easy to line up my letters. I used the little bunnies at the top by my title "Hoppy Easter". 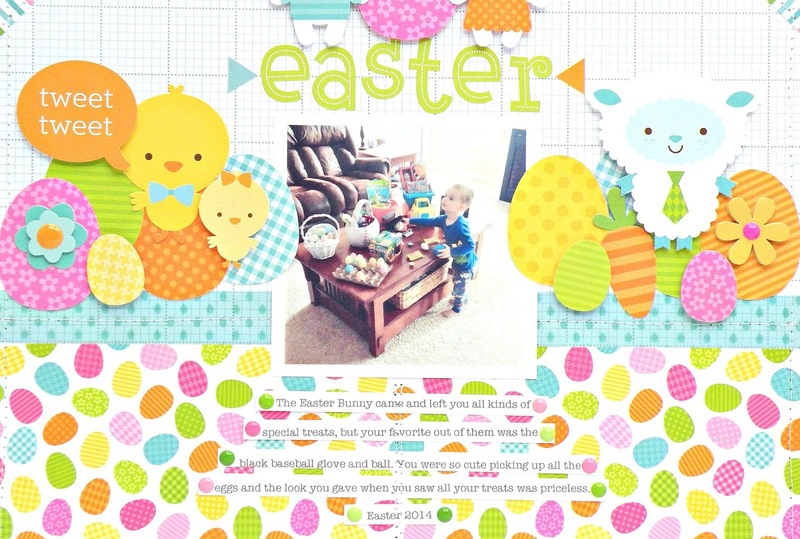 I layered some of the Easter eggs and other little animals on each side of my picture, the little lamb is so adorable! I think it's such a fun little addition to the collection. I chose to add a little busier pattern on the bottom of my layout, this collection is full of bright and theme prints so it was hard to pick just one. to finish off my page I typed up some journaling and cut it into strips to add underneath my photo. I sewed them down then added some Sprinkles to them to prevent them from getting lost on my pattern paper. This is a super easy layout to recreate and have some fun with so I hope you will give it a try. 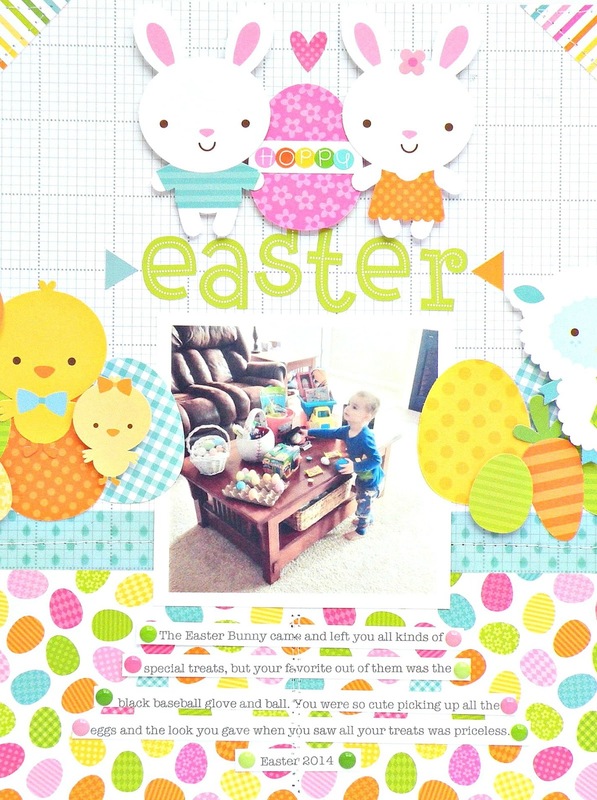 SUPER CUTE layout Stephanie - LOVE IT!!! So many things to love about this layout - the journaling was done in such a way cool, original way!! Love that!! Your use of multiple patterns and colors is super impressive and your groupings are just so well done and perfectly placed!!! Stephanie - you amazed and delighted with this awesome layout!!! Super FANTASTIC!!! !